It isn't often that Chris Gayle bats through an IPL innings. It is even rarer for him to bat through 20 overs and not score a century. After all, he had made 175 in a 20-over match in the very same league. Yet, at Mohali on Saturday, against Royal Challengers Bangalore, Gayle played both the anchor and the aggressor role for Kings XI Punjab and took them to a respectable score while remaining unbeaten on 99 off 64. It wasn't enough to give them a win, as Virat Kohli and AB de Villiers scored half-centuries to give RCB their maiden win. While his teammates found the going a tad tough against spinners, Gayle was determined to make his start count. He had got off to a more than fine start, making 48 in 23 balls within the powerplay overs. This is his highest in the first six overs in this season so far. It is also the third time he has remained unbeaten in the powerplays this year in the seven matches he has played. In seven games, Gayle has made 322 runs at an average of 37.17 and a strike rate of 157.07 this year. 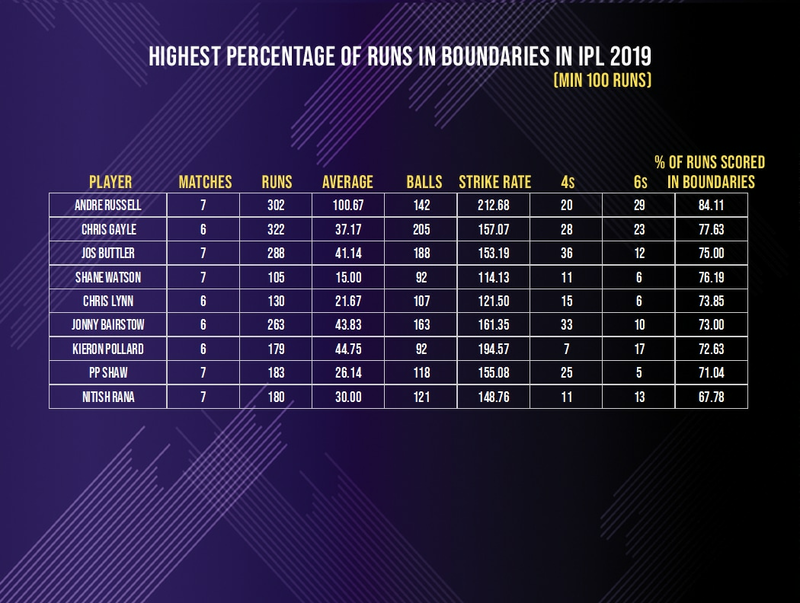 What has stood out is his boundary percentage which is the second best after Andre Russell. The West Indian opener has made 77.63% of his runs in fours and sixes. At Mohali against RCB, 70 of his 99 runs came in boundaries. This season has so far proved to be special for Gayle. The Kings XI opener has struck at a rate of 158.16 in the seven matches which makes it his highest strike rate in IPL since the 2012 season when he had scored at 160.74 in making 733 runs. The batting average of 53.67 is also his highest average in the league since his big year in 2012. 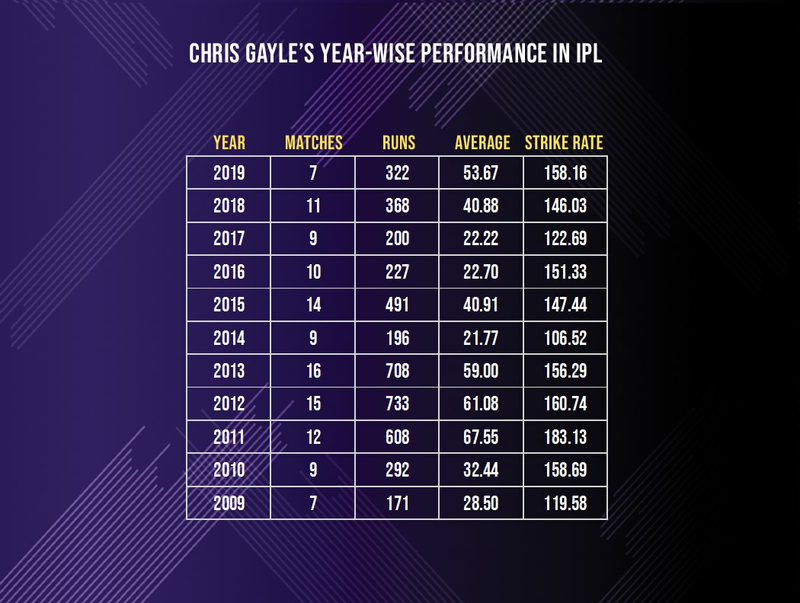 The last two seasons with Kings XI Punjab has also seen Gayle's approach to pace and spin change drastically. 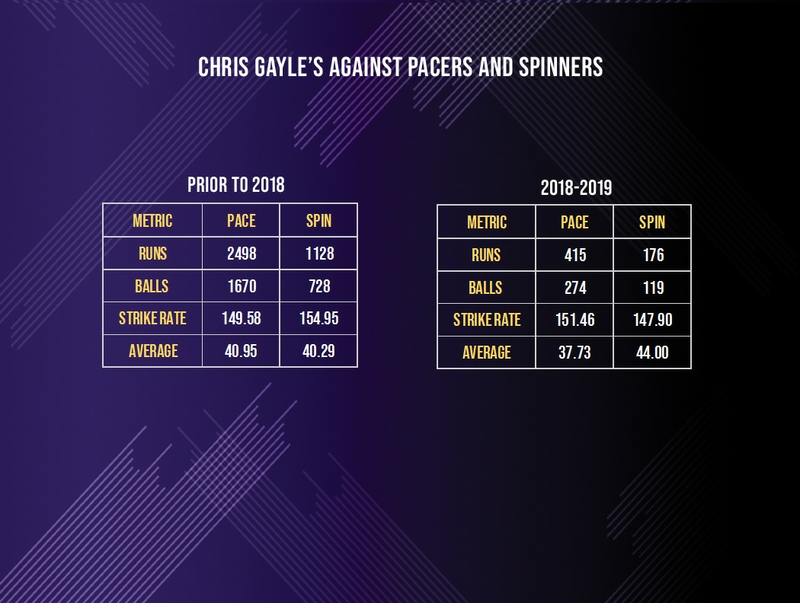 Prior to 2018, his average in the IPL against pace and spin was virtually similar - around the 40 mark. His strike rate against spin stood at 154.95 while against pace it was 149.58. In the last two years, though, he has gotten better at playing spin. The average has risen to 44 against spin while against pace it is at 37.73. The strike rate has also changed. He has gotten quicker against pace (151.46) while slowing up against the spinners (147.9). This kind of showed up, albeit in exaggerated fashion, on Saturday when he played the RCB pacers at a strike rate of 190.69 and the spinners at 80.95. With his third fifty-plus score in seven matches, Gayle is making himself quite valuable at the top for Kings XI. If he continues in the same vein, this could well end up to be a big season for the Universe Boss.